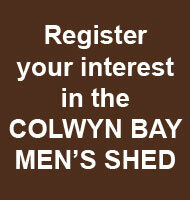 Colwyn Bay Men's Shed is a community group of guys who started in April 2014, meeting in Pentre Newydd Community Centre in Old Colwyn. We obtained the keys to our workshop in February 2015, less than 12 months after starting. The workshop is situated just behind the Town Hall on Rhiw Road in the town and we have several meeting there throughout the week, although we still meet in the Community Centre on Friday Mornings. For the latest on our meeting times and directions to our two venues please go to this page. Also consider subscribing to our occasional newsletter or liking us on Facebook to be kept bang up to date with everything we are doing. The idea behind the Colwyn Bay Men's Shed is based on the very clear need to improve the physical and mental health of older and retired men. It has long been recognised that retired men often have a lower quality of life due to loneliness and isolation with fewer social contacts than women.